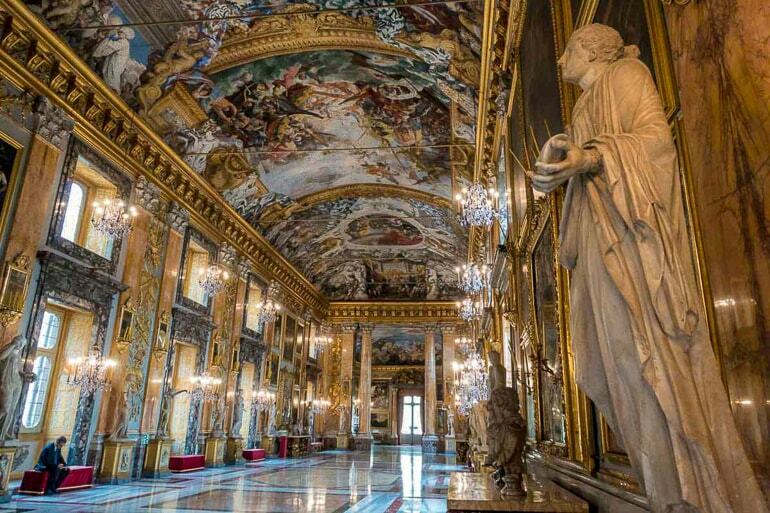 Check Out These Top Italy Attractions As Told By Travel Bloggers! Wondering what is famous in Italy? You are not alone! From Tuscan villas and aging cathedrals to beautiful lakes, mountains, rich history, food, and coastline – Italy is packed with something for everyone. The country is full of unique places to visit – and we’ve actually only just scratched the surface! Funnily enough, we have both been to Italy but it was years ago – well before we were together. We’re sort of planning an upcoming trip back to Italy together – and so we needed advice, too! So, since there are so many amazing things to do and see in Italy, we asked a few fellow travel bloggers for their input. The list below is the result of that – and wow has it become a great resource that is sure to help you (and us) trip plan! Not to mention there are really pretty photos to look at. From the classic Rome tourist attractions to lesser-known towns, here are some of the top attractions in Italy! 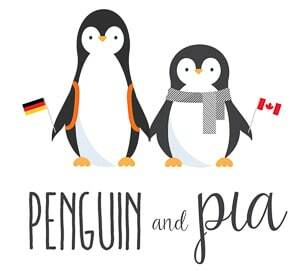 Before you start trip planning and dive into the great places you can visit across the country, you should consider a few details for your trip – from weather and climate to language, currency, and more! Italy is located in southern Europe – it’s a very long country shaped like a high-heeled boot. Because of its unique shape and place in Europe, Italy has a bunch of different geographical features from the Italian alps (mountains) in the north, tranquil lakes in the middle, and drier, more rocky coast at the bottom as it enters the Mediterranean Sea. Italy has a very long and fascinating history – with Ancient Rome having played a significant role in shaping the continent of Europe. The language spoken in Italy is Italian – but you can get by with English in most tourist areas like Rome, Venice, and Florence. However, it’s always good to take the time to learn a few simple words like hello – “Buongiorno”, please – “per favore”, thank you “grazie”, and goodbye “ciao”! Today, Italy is part of the EU and the Schengen Zone. The currency used in Italy is the Euro which makes it easy if you are also travelling to other countries in the region! Speaking of money, since Italy is so popular – do watch your pockets and your belongings when travelling. There are lots of tourist traps to be aware of in Rome, Venice, and other popular centres (speaking from experience here). The answer to the question “What is the best time to visit Italy” is: it depends. It really depends on which places you plan to visit and what activities you want to do. Italy is a pretty big country with various geographical difference between the north and south. The best time to visit the Italian Alps in the north is different from the best time for Tuscany, the lake district or the Adriatic coast as it extends south into the Mediterranean Sea. That said, the summer months from late May to the end of August are the peak time to visit most areas of the country. The weather is generally consistently hot and sunny. However, while it’ll be nice outside, the crowds will be absolutely atrocious in the city centres. Even smaller, popular rural towns and lakes will have their share of humans during these months. We’d suggest (if you can) travelling in the shoulder season from March to mid-May and then again in September and October. The weather (especially in the south) will still be warm and pleasant and the crowds will not be at their peak. Obviously, if you want to ski in the Alps, then aim for January or March for the least precipitation but still cold temps and good conditions. Basically: summer in Italy is crazy busy. Period. If you aren’t staying in one place when you visit Italy, you’ve got options to get around the country. You could fly – but the countryside is beautiful and worth seeing! That said, the trains in Italy are pretty good. You can learn about the train system, plan journeys, and book tickets at the official ItaliaRail website. The country is also well-connected via the buses – with FlixBus a top choice for cheap, safe, and reliable transport between larger centres. If you want to have the freedom to roam, you might consider renting a car in Italy and driving yourself across the country. Driving is done on the right and the highways are pretty good to get you large distances in a hurry. Smaller, more rural and country roads are also good – but as in lots of countries, the smaller, more “off the beaten path” you get, the less reliable the roads can be. Once you are in a city, you might take the public transport system to get around – and each city has unique ways to get around. In Venice, you can make use of the water taxis. In Rome, you might opt for more of a hop-on hop off bus ticket to get around and learn as you go. You might be best just wandering on a walking tour to explore the Colosseum and the city! If you are looking for places to stay in Italy, you will certainly have your pick! The country is full of a healthy mix of hotels, guesthouses, apartments, hostels, private villas, and more. It really depends on where you are looking to stay. Many cities specialize in hotels while the more rural areas or areas by the lakes or coast have holiday apartments and villas for rent. To each their own! If you are planning a trip to Italy, you can check for accommodations in Rome, Florence, Milan, and Venice – just to get you started. You might also be looking to backpack around the country and stay on a tighter budget, in which case you can find hostels in Italy here. In a post on unique hostels across Europe, you can read about a recommended B&B hostel – Mosi Firenze, which is located in Florence! 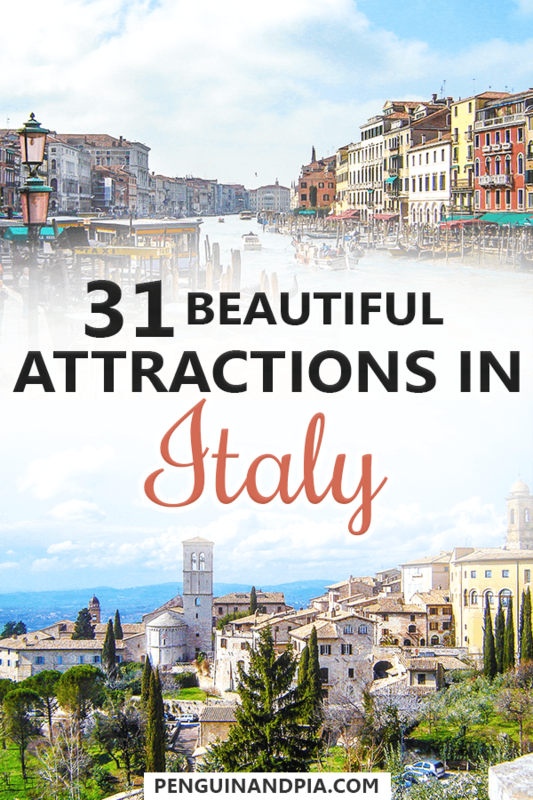 Okay, so now it’s on to what you’ve been waiting for – the attractions and places to visit in Italy! This list is in no particular order, so have a read through and get planning! In case you want to just dive in, you can find and book top attractions in the widget below. Often times, booking a line skip ticket in advance pays for itself in time saved once you arrive! The one, the only – the Colosseum in Rome! If you are heading to Italy, there’s a good chance you will stop through Rome. If you do, there’s a pretty important attraction people talk about – and you may have heard of it. It’s this big oval structure that has been standing since the year 70 AD! 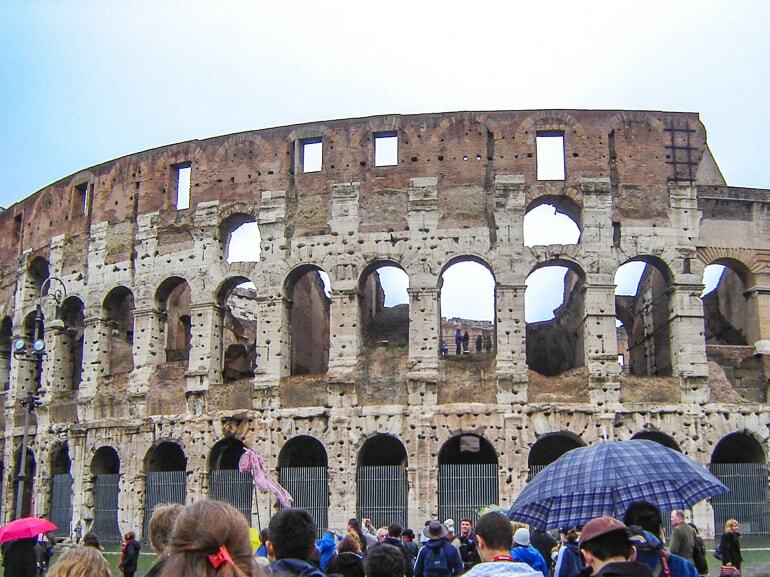 Of course, the Colosseum in Rome is a stand out attraction. As the largest amphitheatre ever built, it’s no wonder it still impresses visitors around the world 2000 years later. Even if history isn’t your thing, a visit to the Colosseum is a must-do. It’s a fascinating feat of architecture and a glimpse into Ancient Roman times. Eric has visited and to this day he still remembers how neat of an experience it was being inside the Colosseum. Since it’s so popular, the lines can be pretty long so consider an official skip the line ticket to the Colosseum, Palatine Hill, and Roman Forum! This shot was taken from the base of the bridge! 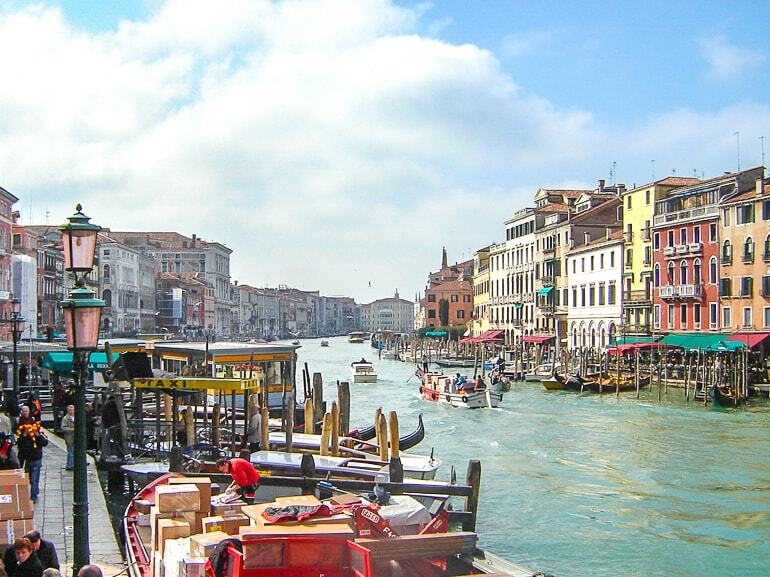 If you are heading to Venice, there are plenty of amazing attractions to explore. From the Doge’s Palace and St. Mark’s Basilica to exploring the alleyways and wandering over canal bridges, there’s so much to experience in Venice. One of the most famous and the oldest of the four bridges to cross the Grand Canal (the main canal through the heart of the city) is Rialto Bridge. Built back in 1588, this bridge draws crowds for its stunning views of the canal in either direction (see Eric’s photo above) and for its own architecture. 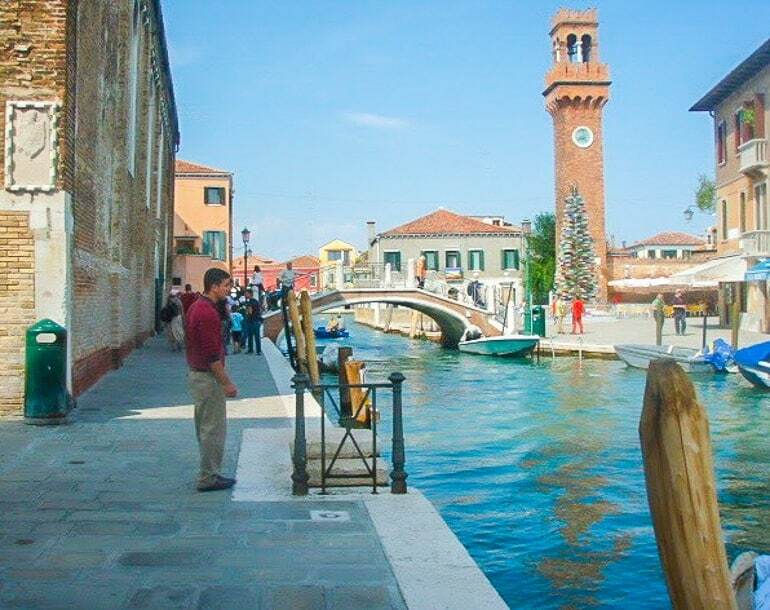 The bridge can get pretty busy – but it’s a great vantage point and it’s functional to get around Venice, too! The cathedral dome majestically above Florence. Officially the Cathedral of Santa Maria del Fiore, the Florence Cathedral, or the Duomo di Firenze is a sight to see on any Italy trip. This popular Gothic structure has been drawing in visitors for centuries. Construction started in 1296 and took around 150 years to complete! 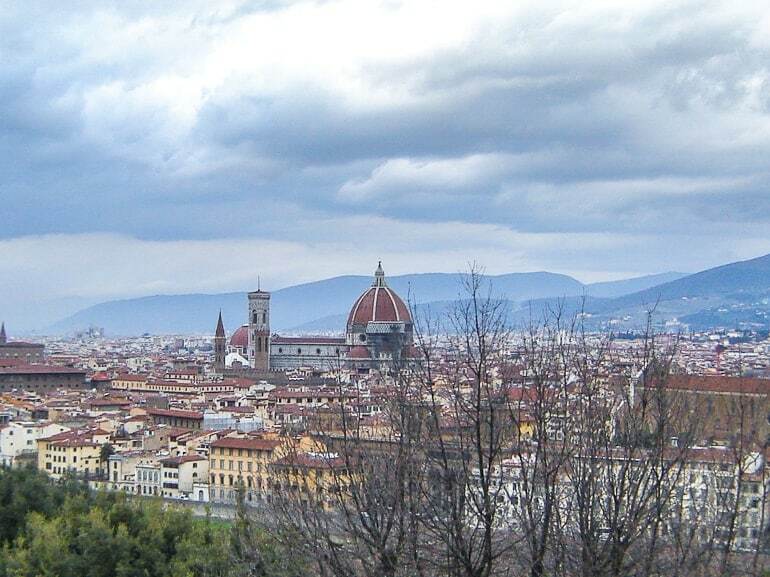 Today, the cathedral and the famous red-tiled dome stand proud among the Florence skyline. If you are heading for Florence on your Italy trip, you should look into Cathedral tickets in advance since it’s a popular attraction. But it’s worth it to tour the cathedral and climb the 463 steps for amazing views from the dome! Cinque Terre is a stunning coastal area along the Italian Riviera and definitely one of the must-see places in Italy. Five little villages perched between the mountains and the sea are incredibly picturesque and, together with the surrounding coastal areas, form a UNESCO World Heritage site. It’s not easy to get to the villages by car – it’s best to either take a boat, a train, hike, or a combination of the above. You can visit Cinque Terre in one day or you can spend a few days here. If you have more than a day in this area, don’t miss the nearby Portovenere village – it’s really beautiful and isn’t as overrun by tourists as the five towns of Cinque Terre. Located within an easy reach from the other major tours destinations like Florence or Pisa, Cinque Terre attracts huge crowds. If you can, avoid visiting in the summer months. 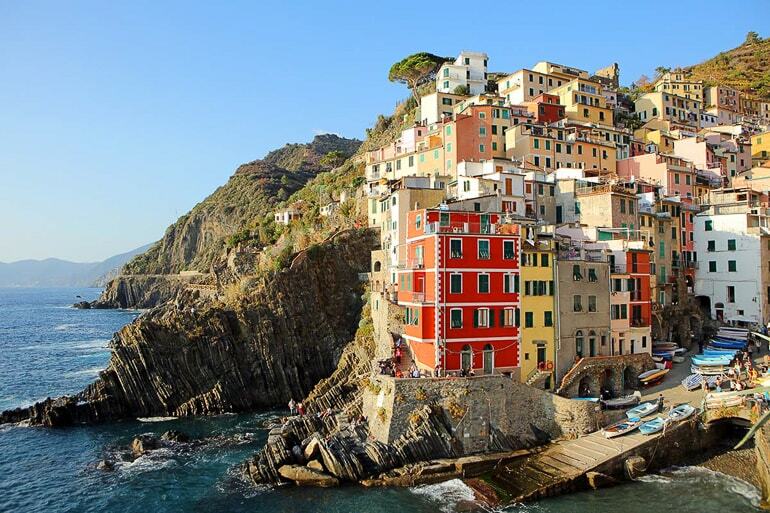 Probably the best time to visit Cinque Terre is the shoulder season: March – April or end of September – October. Boat service stops in November, so if you come in the winter, you’ll have to take a train. 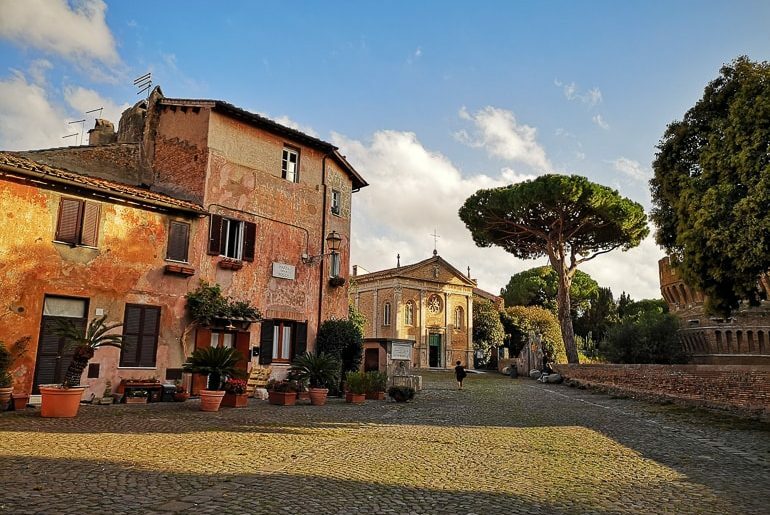 A wonderful corner of Italy and one I recommend all visitors to add to their Italian itinerary is the gorgeous small village of Ostia Antica. Located just outside of Rome, Ostia Antica is famous for being the city’s ancient port and is now home to a wonderful archaeological park. Often compared with Pompei, but smaller and quieter, Ostia is a very well preserved site and one that is easy to enjoy. Not yet discovered by mass tourism, here you can spend your day wandering around ancient Roman streets and taking in the beauty of Ostia’s old theatre all while being surrounded by the park’s tall pine trees and large open spaces! It is a great place to escapes the busy streets of Rome without having to give up sightseeing. The park is what attracts most visitors here but just beside it lies what I believe is the real hidden gem of this area: Ostia Antica’s medieval borgo (village). 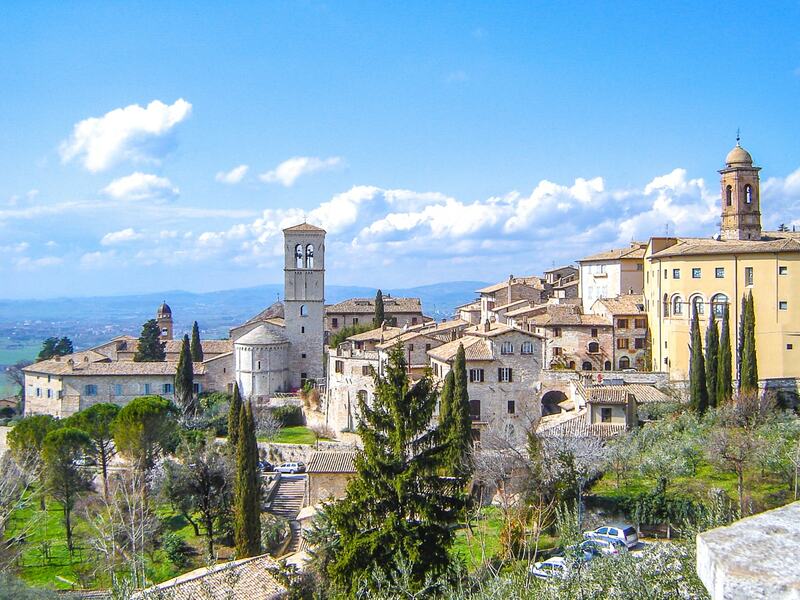 The borgo is an enclosed square developing around a turreted castle and a small yet impressive church. The houses opening up onto the square are private homes but they are worth seeing because of the beautiful colours of their walls and the cascading flowers now decorating them. You can visit both the park and the borgo in the space of an afternoon. I highly recommend coming in spring, when you can finish your day with a meal in the borgo’s tiny and delicious family restaurant! A town carved straight out of the mountain, it is known as”la Città Sotterranea” (the Subterranean City). The city is a UNESCO World Heritage Site. It has been inhabited since prehistoric times and is so surreal and unique that many movies have been filmed there including The Omen, Mel Gibson’s The Passion of the Christ, and most recently, Ben Hur. 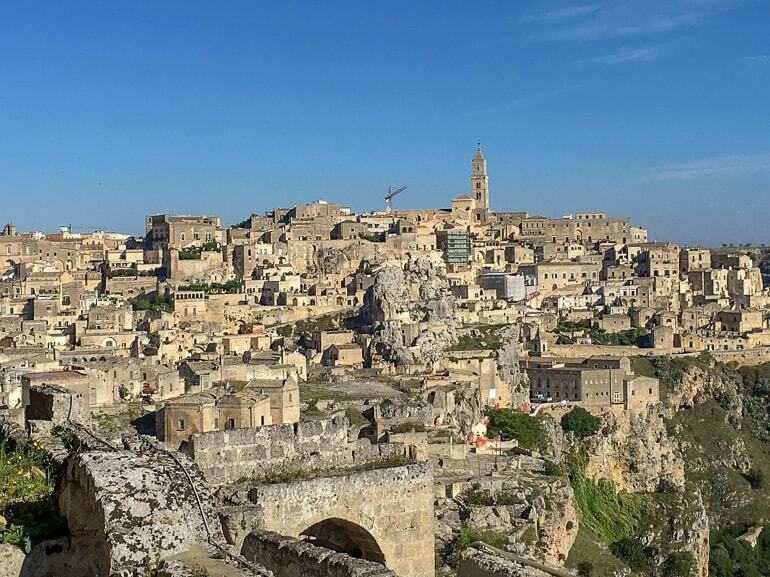 So many of Matera’s sites are underground. The caves are used as homes, theaters, restaurants, churches. You can stay in a cave hotel. There is even an underground museum filled with sad statues depicting dancers and young girls looking wistfully in the distance. Maybe they are sad because they are in an underground cave without sunlight. Matera is as unusual and unique a city as any I’ve ever been to. Despite its cave dwellings, it can be charming above ground. There are open parks and gelaterias everywhere. One of the most interesting aspects of Materia is its history. Stop by the local museum and see who such a city developed over the years. Not many people make it to Cagliari during their trip to Italy. They are missing out because the capital of Sardinia is a lovely place to visit in any season. The center of the city is a maze of narrow cobbled alleys and colorful buildings, with lovely small cafés scattered around. The city is packed with viewpoints from where you get to enjoy some of the most impressive sunsets in the Mediterranean. 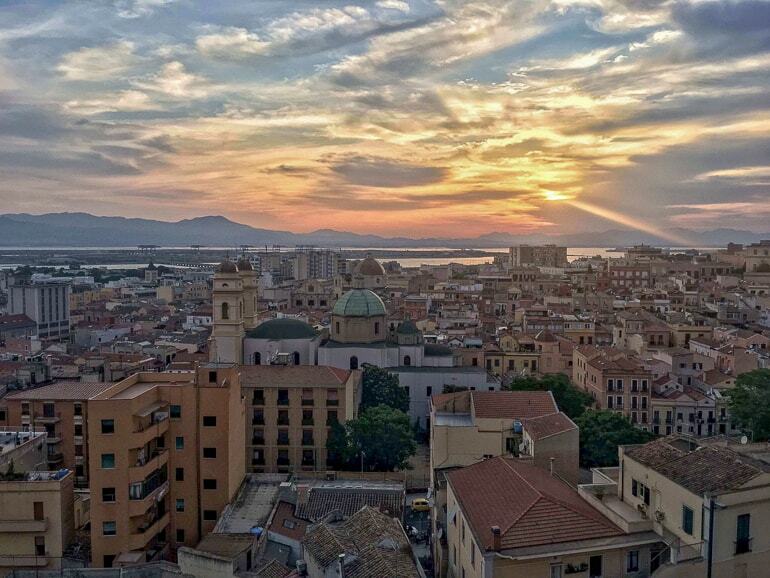 Cagliari has a long history, which can be found in the many churches, archeological sites and museums scattered in the center. The beautiful urban beaches – Poetto and Calamosca, among others – are perfect places to relax for a few hours and they give easy access to Molentargius, a natural park from where it is possible to admire pink flamingos, and to Sella del Diavolo, a promontory that can be easily hiked for incredible views over the city and the bay. 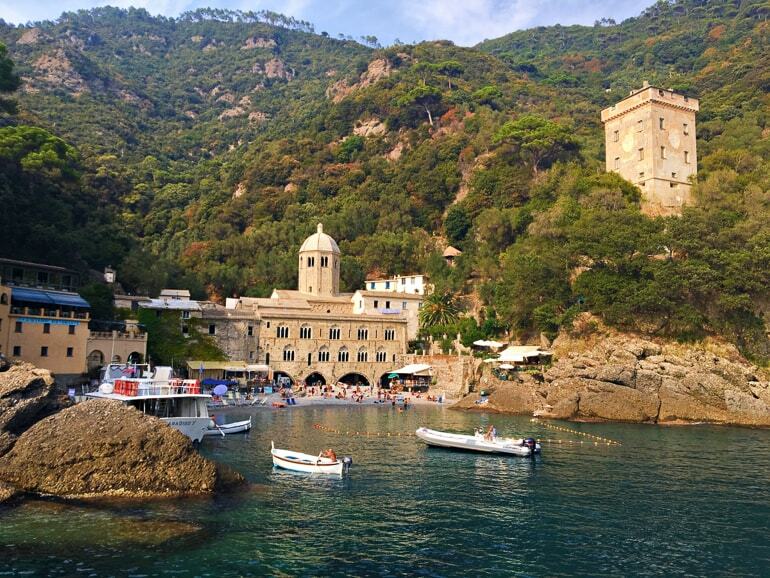 One of the best experiences you can have in Italy is a day trip from Rapallo to San Fruttuoso. Boats leave frequently from a dock in the middle of town to Santa Margherita and then on to Portofino. This tiny port town is the playground of the rich and famous. It’s incredibly picturesque – a tiny bay crammed with boats and surrounded by brightly painted houses. Explore a little before taking a path up a long set of steps into the hills above, past lemon trees, tiny olive groves and fields of wild flowers. Portofino Bay soon becomes a tiny gem shining far below. The Mediterranean sparkles in the sunshine and the fresh air is invigorating. The main part of the hike is flat, with the sea far below. Eventually, you’ll descend a series of switchbacks through some cooling trees down to a tiny emerald green bay backed by the golden San Fruttuoso Abbey. The bay is a true hidden gem, accessible only by boat or on foot. There is a small museum in the 13th-century Benedictine monastery and they are several seafood restaurants overlooking the water. You can rent deck chairs (the beach is pebbly) and spend the rest of the afternoon cooling off from the hike in the sea. End this perfect day by taking a boat directly back to Rapallo where you can relax with pizza and a glass of wine at a waterside cafe. We all know that Italy has amazing food but if you are a lover of cooking then why not do a cooking class at the former home of the man who created Italy’s Bible to cooking at Casa Artusi in Forlimpopoli. “Science In The Kitchen And The Art Of Eating Well” was published in 1891 by Pellegrino Artusi and since then has been translated into English, French, German, Dutch, Spanish, Portuguese and Russian. This book contains over 790 traditional recipes and is considered a literary classic – and if you travel to the small town of Forlimpopoli you can visit Artusi’s home and even experience a cooking class. The best way to get to Forlimpopoli is to visit as a day trip from Bologna in the Emilia Romagna region of Italy. On the grounds of Casa Artusi you can visit the on-site library that contains over 45 thousand books including many original editions of “Science In The Kitchen And The Art Of Eating Well”. There is also a restaurant on the grounds with exquisite food but we highly recommend getting your hands dirty and learning to make some of the dishes yourself at the cooking school. 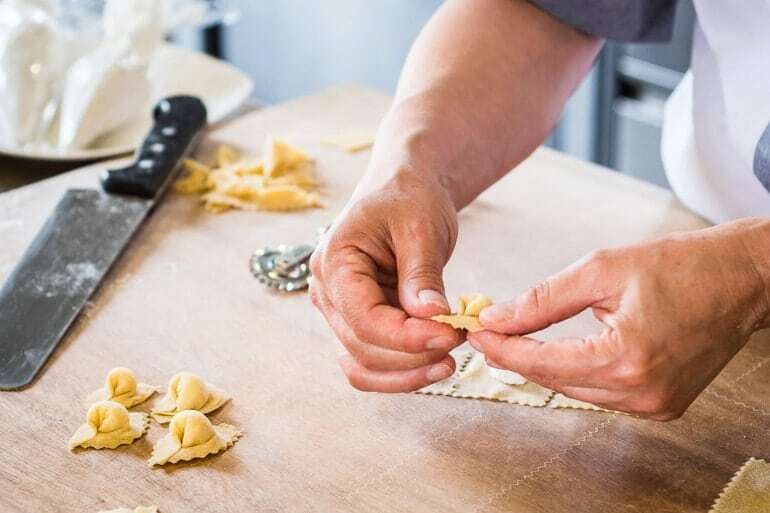 This is actually a cooking school that is attended by both amateurs and professionals wanting to broaden their knowledge of traditional Italian cuisine and learn how to make traditional Romagnolo home cookery, including fresh, home-made pasta and piadina (the local flat bread). It’s certainly a unique and memorable place to visit in Italy for true lovers of food. Sicily is home to some of Italy’s most robust Italian culture, especially when it comes to the food. Now, many would argue that Italian food is already robust in nature, but Sicilian food is its own genre. If you want to get a taste, literally and figuratively, of the passionate people of Sicily, your one stop should be to La Pescheria, the fish market. La Pescheria is located in the city center of Catania, Sicily where you’ll find all the locals selling their fresh produce and seafood. The perimeter of the square is lined with vibrant colors of fresh vegetable stands while it’s center is filled with rough looking fisherman, still in their wellys, spraying down decapitated fish and remaining blood off the table. It’s a bit chaotic but it’s absolutely lovely in every way. From the quality of the food to the entertainment of the street vendors, you’ll see and taste the best of Sicily at La Pescheria. 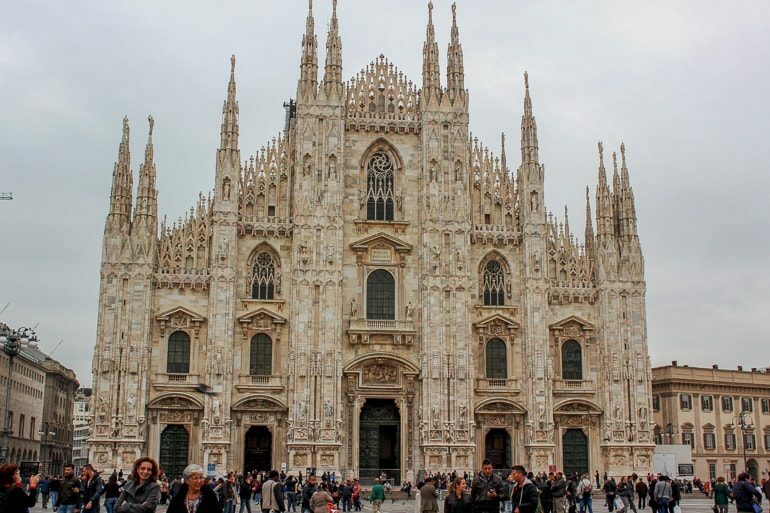 The Milan Duomo is one of the most spectacular architectural masterpieces of all time. The gothic cathedral near the city center of Milan, Italy took six centuries to build, and it’s easy to see why with all the intricate spires and pinnacles that make up the church’s exterior. As the largest cathedral in Italy, the Milan Duomo is definitely one of the best attractions to visit in the country. In fact, it’s worth spending at least one day in Milan just to see the Duomo. The inside of the cathedral is equally breathtaking with its large, marble pillars and elaborate altars. For a small fee, you can visit the terrace on the roof of the cathedral where you can see the Duomo’s detailed construction up close. It’s worth the extra money to visit the terrace and look out over the piazza through the forest of spires. Our visit to the Roman Forum and Palatine Hill allowed us to step back in time and gain a deeper understanding of Roman history. The Roman Forum and Palatine Hill are located next to the Colosseum in central Rome. Admission to these two interconnected sights was included in our Colosseum tickets. 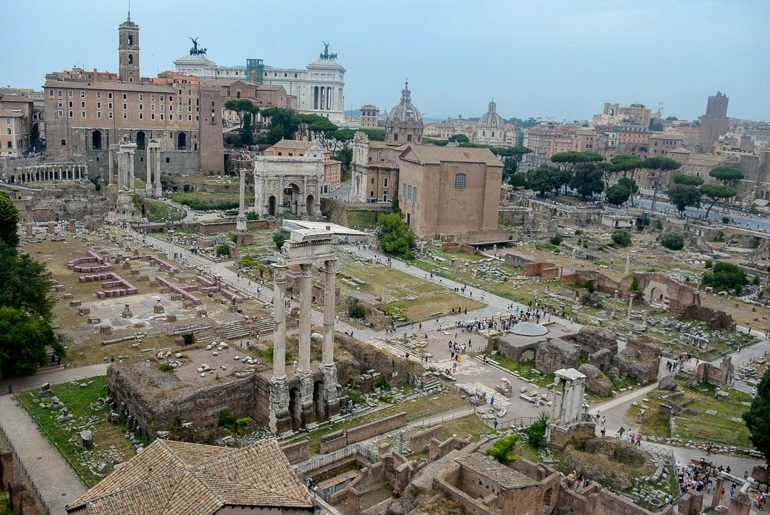 While most of the remaining structures are in ruins, the remains sparked our imagination of what the governmental, cultural and civic center of Rome looked like thousands of years ago. Our kids were wowed by the Circus Maximum where the Ben-Hur chariot races took place, the Palace of Domitian and the three columns standing from the Temple of Castor and Pollux. We also made sure to examine the Arch of Titus, which was an inspiration for the Arc de Triomphe in Paris. We were glad we had a chance to explore these two sights before our Colosseum tour. For budget visitors or those with limited time, much of the Roman Forum and Palatine Hill are visible by walking around the periphery, and we wish we had a chance to see it lit up at night. Courmayeur is in the mountainous northern region of the Aosta Valley in Italy, nestled in the Alps, just on the Border with France. It is perhaps most famous for its dramatic views of Mont Blanc (or Monte Bianco in Italian), upmarket ski resort status and for being a mecca for mountaineers and hikers. 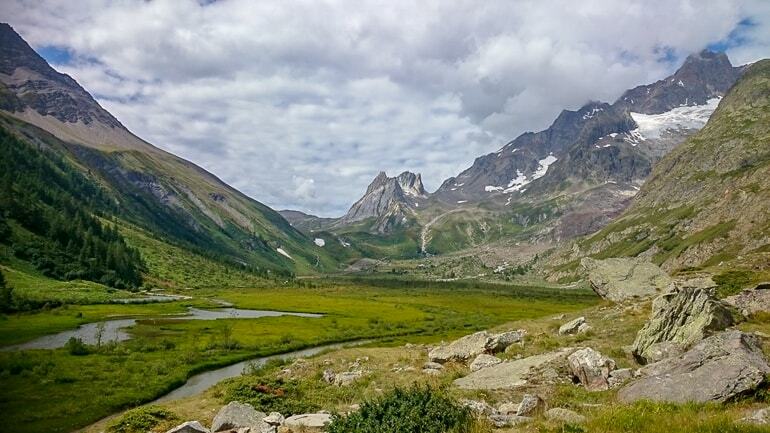 Even for novice walkers, there are some amazing easy day hikes, those through Val Veny and Val Ferret are breathtaking. Outwith the winter and summer season, this beautifully preserved and traditional alpine village has a friendly and very sleepy vibe. If your not a hiker you can get great 360-degree panoramic views from the uniquely rotating Skyway Monte Bianco Cable Car. Relax in the luxurious QC Terme Spa in nearby village Pre-Saint-Didier. With over 40 de-stressing activities, including a massive outdoor thermal spa area with jaw-dropping outlooks. Enjoy some local Fontina Cheese and Pan Ner (traditional black bread) at one of the many great bars or restaurants. My favourite is family run Ristorante Chalet Plan Goret (booking advised). Marvel at the athletic ability and endurance of the competitors taking part in the Tor Des Geants. This 330km mountain race takes place in September and competitors run a mountainous route that starts and ends in Courmayeur. The carnival atmosphere in the village is fantastic. Courmayeur is just half an hour away from Chamonix, an hour and a half from Frances ‘Little Venice’ Annecy, and less than an hour from the historical region capital, Aosta. Rent a car and enjoy discovering all the characterful mountain villages that surround Courmayeur. Parma is not just for ham! 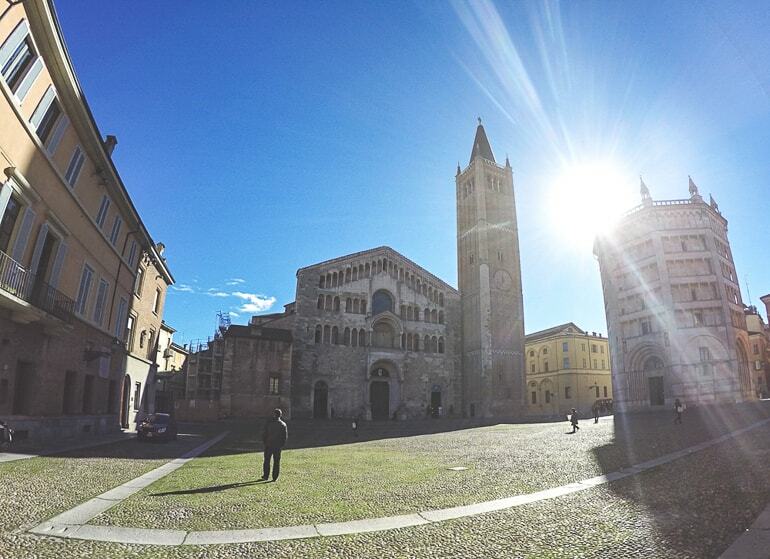 The main square, Piazza del Duomo, is a history-dense and intact medieval masterpiece. Located well outside the bustle of the city, it’s also a very quiet spot to stop by and admire several sights all at once, most notably the beautiful marble Battistero. Considered by many as one of the most important Medieval monuments in Europe, it’s an impressive octagonal structure made entirely of pink Verona marble. The imposing structure of Romanesque-Gothic architecture was built between the 11th and 13th centuries and is covered in intricate sculptures. But of course, that’s not all. There’s the Bishop Palace to one side of the Piazza, the Diocesan Museum to the other side, and the piece de resistance, the main cathedral, or the Duomo, itself. Here, you can lose yourself for hours in art history. The main fresco inside of the dome, the Assumption of the Virgin by Correggio, is one of the most mesmerizing Renaissance paintings I have ever seen in my whole life. Definitely, do light it up by feeding the rather gimmicky coin-operated dome light a euro. It’s totally worth it! The Royal Palace of Caserta is a former royal residence located in Caserta in Southern Italy. It’s one of the largest palaces in Europe with 1200 room, 5 floors, a library, and a huge garden. 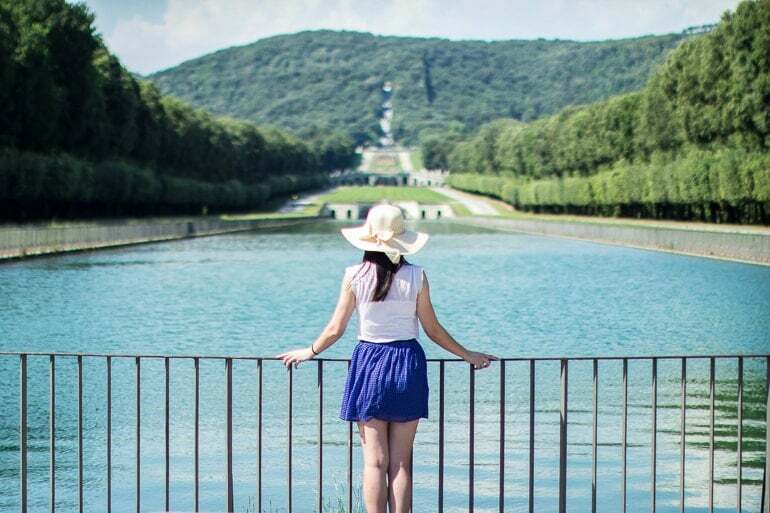 One may find a resemblance between the Royal Palace of Caserta and the Palace of Versailles outside of Paris and it’s because the Palace of Caserta is modeled after the Palace of Versailles! It is surprising that the Royal Palace of Caserta is an off the beaten path destination in Italy since it is so beautiful and magnificent. Potentially it’s overshadowed by Pompeii, another popular tourist destination in Italy and a popular day trip from Naples. It takes about an hour by train to reach Caserta from Naples and there are frequent train services between the two cities. The palace is a few hundred meters from the train station in Caserta making it very easy to visit. Since the palace is not very well known for many tourists, there generally is not a crowd especially if you visit later during the day. For most part of the afternoon, you may have the gardens to yourself. Note that the palace is closed every Tuesday. Plan at least 2-3 hours to visit the palace and enjoy the trip. Few places in Southern Italy are as charming as the Aeolian Islands. This archipelago made of 7 volcanic islands off the coast of Sicily is best visiting in the summer months. It can be reached by a hydrofoil ride departing from Milazzo, a small town near Messina. It’s the perfect place to go on a sailing trip – but if this is not your thing, there is still plenty to see and do. Each island is different and offers a different experience. If you are looking for luxury and a bit of pampering, Vulcano may be the place for you. There you will find lots of boutique hotels and luxury resorts, and you will be able to visit the mud baths as well. An easy hike to the Gran Cratere (great crater) will provide incredible views over Lipari – the biggest island in the archipelago. Adventure lovers should head to Stromboli, home of the most active volcano in Europe. The tiny village is the perfect departing point for guided hikes to the craters, from where visitors get to enjoy the regular explosions and to admire one of the most beautiful sunsets they will ever see. One of my favourite places in the whole of Italy is the stunning city of Siracusa. 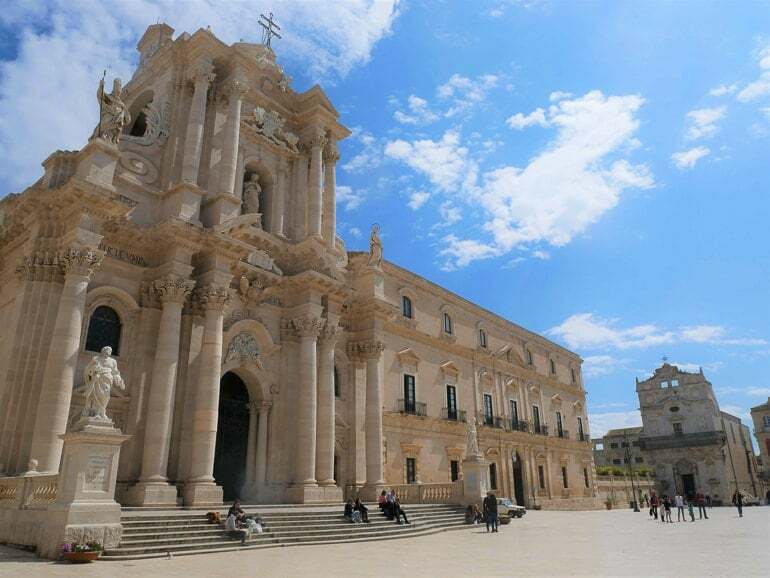 Located on the East coast of Sicily, Siracusa dates back to Greek times and now mixes seamlessly ancient history, medieval charm, and a modern vibe. It is a wonderful place to add to your Italian itinerary and one that for many stays as a highlight of their whole trip. The city has two main areas of interest to the visitor: the old centre, which develops on the small island of Ortigia, and the archaeological park. Ortigia is small and beautiful. Here you have relatively little traffic and a plethora of small meandering alleys hiding architectural treasures such as the temple of Apollo, the fountain of Arethusa and the impressive duomo. This one opens up on a large square and is unique as it mixes remains of the ancient temple of Athena with Sicilian baroque style. The archaeological park has a different vibe from Ortigia but is equally impressive. Here you have Siracusa’s Greek theatre and the infamous Latomie, the quarries where so many prisoners lost their lives when Siracusa ruled the Mediterranean. The park is a short bus ride away from Ortigia and both can be visited in one day. If you can, I recommend you visit in spring when the weather is beautiful but not yet too hot and start your day in Ortigia to then see the sun set over Siracusa’s archaeological park. The enchanting Isle of Capri should definitely be on your itinerary for Italy if you plan to visit the southern region of Campania. Made up of two towns, Capri and Anacapri, the island is located in the beautiful Bay of Naples. It is easily accessed by ferry from Sorrento or Naples. In fact, Capri is one of the best day trips from Sorrento you can do. 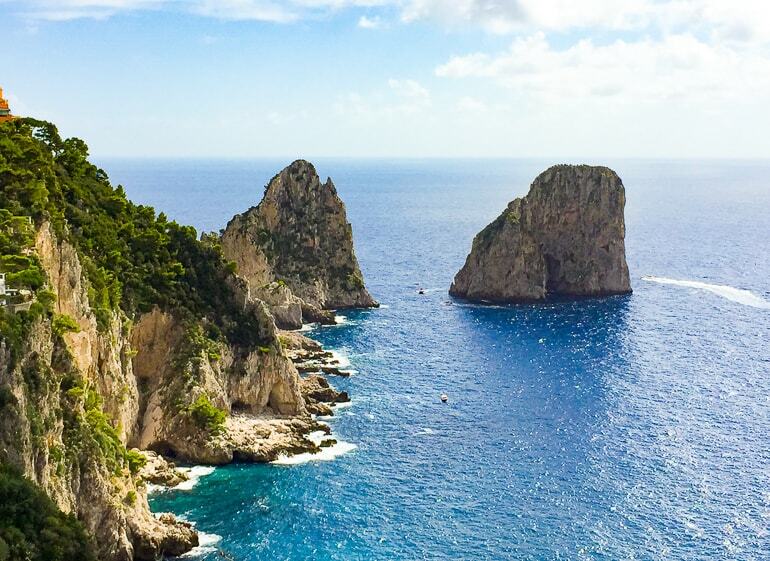 Capri’s beautiful blue waters, elegant villas, and gorgeous gardens will captivate you. Once on the island, do a boat tour that goes around the island. If conditions are right, you can visit the famous Blue Grotto! Your boat will pass through the enormous Faraglioni rocks and past the Capri lighthouse. Then take the funicular up to Capri Town, where you can wander the streets, taking in the views of the water, and spend some time in the famous main square, La Piazzetta. Finally, take the bus up to Anacapri, where you can take the chairlift to the top of Mt. Solaro and visit Villa San Michele, with its lovely terraced gardens. While in Capri, don’t forget to have a panino caprese for lunch and a slice of torta caprese to follow! Whether you’re looking for a weekend getaway from Milan or taking a road trip through northern Italy, you have to visit Lake Como, the third-largest lake in Italy. 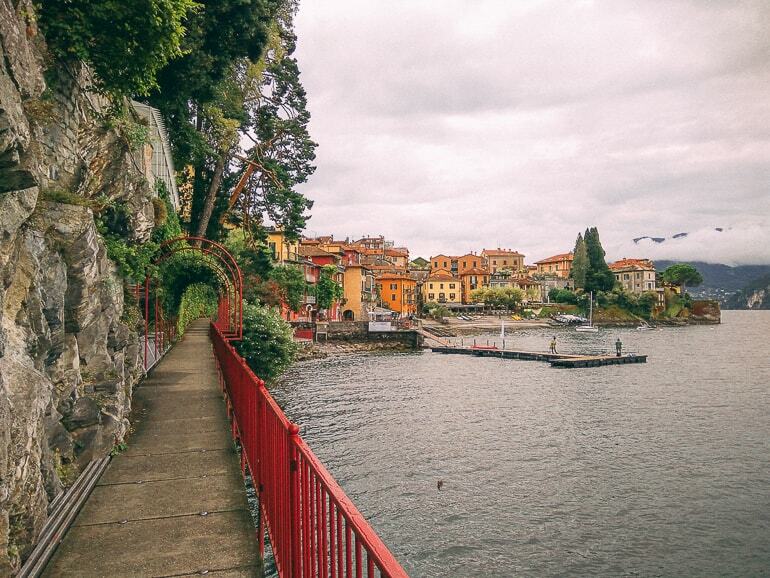 The lake is famous for its Roman villas (luxurious country houses built in the Roman times) like Villa Carlotta, Villa d’Este, and Villa Serbelloni. Nowadays, the villas around the lake are functioning as luxury hotels, museums, conference centers, etc. The lake is also home to many beautiful towns and villages that are worth exploring. Bellagio and Varenna are probably the most popular ones, but if you have more than one or two days, you can also visit cities and towns like Como, Lecco, and Menaggio. To enjoy the best of what Lake Como has to offer, I recommend visiting in early autumn. The weather is much more pleasant than in plain summer and there are a lot fewer tourists. For these reasons, I believe that late spring would also be a great time to visit the lake. In a country full of historic sites, the Pompeii archaeological site is one of the most unique places you can visit and makes a perfect day trip from Naples or Sorrento. In AD 79, nearby Mt. Vesuvius erupted and buried the city in ash and pumice stone. The layer preserved the city as it was on that day for centuries before excavations began. Villas, bakeries, religious sites, baths, and more fill the ancient city. Visitors can explore on their own or take tours to see the excavated buildings. The amphitheater there even holds concerts because the sound quality in it is so good. Though most of the frescoes and other décor have been removed to be housed in museums and other collections, some of the buildings still have their original wall paintings from all those centuries ago. Don’t miss the Forum, which houses some of the most impressive ruins in the city and was a central gathering point for its inhabitants. The eeriest reminder of the devastation here comes in the form of the plaster casts made of the bodies found during excavations. Many of the people and animals of Pompeii were buried by the ash and pumice and as their bodies decomposed, they left voids in the stone. These were filled with plaster by archaeologists and give a heartbreaking insight into what their final moments might’ve been like. When you peer into the crater of Mount Vesuvius, you’re staring into the eye of a beast that once reshaped life along the coast of Campania: in 79 AD, it was this crater that spewed the lava that buried Pompeii and Herculaneum. 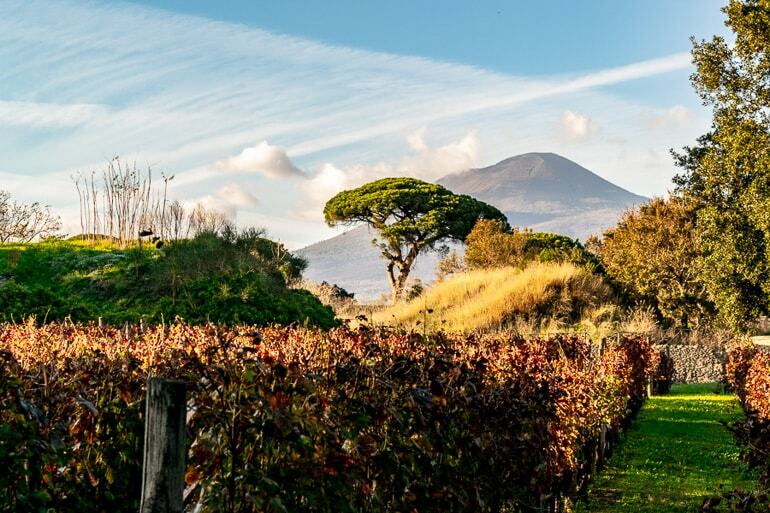 Today, visiting Mount Vesuvius is extremely low-risk–the volcano hasn’t erupted since 1944 – but it’s still a bit thrilling to hike along the edge of an active volcano, especially if you pair it with a visit to Pompeii. The climb from the parking lot where you’ll arrive at Vesuvius, either by car or bus, to the crater, only takes about 20 minutes, but the views of the Bay of Naples, Capri, the Amalfi Coast, and Pompeii below are pretty magnificent. 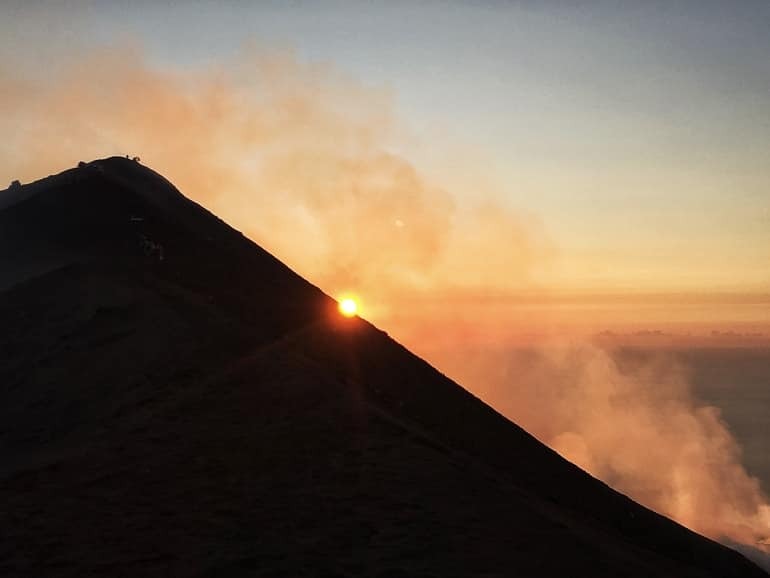 If you can, definitely visit Mount Vesuvius on a very clear day, as the views truly are one of the best parts of the experience, and haze can disrupt that. You can visit Mount Vesuvius either via a tour or simply by taking public transportation. If you have a rental car, you can also drive up. There is a small shop with coffee, drinks, and snacks located in the parking lot of Mount Vesuvius, but we recommend bringing at least a bottle of water along with you. Additionally, the loose, volcanic sand and gravel can make the hike a bit uncomfortable in sandals, so consider wearing closed-toe shoes when you visit Mount Vesuvius! Volterra is a small hilltop town located in the Tuscan region of Italy. It is about 1.5 hours southwest of Florence by car. If you are planning a visit to the Tuscan region and have the bigger cities of Siena and San Gimignano (also lovely) on the list, then be sure to add Volterra. 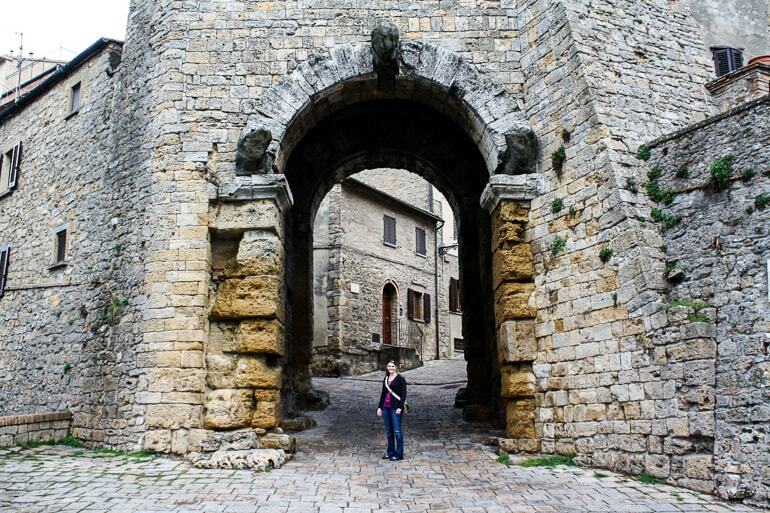 Volterra is a medieval walled city that dates back to the 7th century BC. It features a Roman theater, town square, city hall, Cathedral with Bell Tower, and Etruscan museum. The highlight is the shops and craftsman using alabaster to create a variety of items to sell. Ask to step inside and watch them work away on a masterpiece or string small beads on a delicate bracelet. 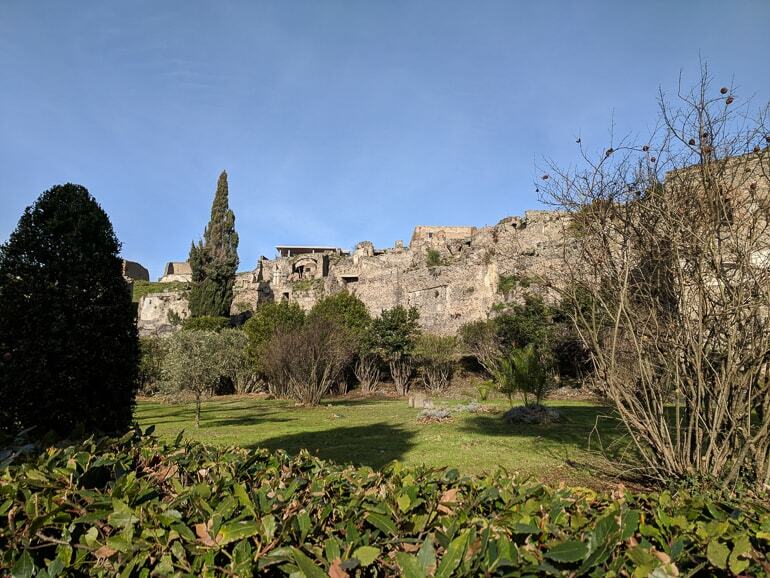 Then continue to wander through the city, exploring the Etruscan gates and linger over a delicious Italian lunch at one of the many amazing restaurants. Looking for more places to visit in Italy or across Europe? Check out my Europe Guide on my blog. As one of the little islands right off the city of Venice, Murano Island is a quaint island, home to the world-famous Murano glass. Hopping on a ferry over to Murano is a quick way to visit the colorful island. Strolling through the narrow alleys hugging the canals, visitors can pop into one of the numerous shops selling Murano glass. It comes straight from the source and there is an unlimited assortment of jewelry, wine stoppers, ornaments, and so many other pieces. Tip: be sure to look for the “Vetro Murano Artistico” trademarks when purchasing authentic Murano glass! Murano glass makers have open factory tours where glass blowing demonstrations are common. The history of Murano glass making is remarkable, as historically, it is one of the most sought after and well-known glass making locations in the world. Murano glass is found across royal palaces and homes across the world, and its immense beauty and precision making is considered unique to its history and craftsmanship. Apart from visiting glass making factories, stopping at the Chiesa di San Pietro Martire as well as the Basilica dei Santi Maria e Donato is well worth a visit. Finally, simply wandering the quiet canals, which differ a bit from Venetian canals, make for a memorable visit to Murano Island. The Leaning Tower of Pisa is an iconic symbol that represents the century-old architecture of Italy. Much like the ancient streets of Rome and the water canals in Venice, the Tower of Pisa is a must visit for anyone embarking on a trip across Italy. Pisa is an adorable city that lies in Tuscany. It’s an hour and a half away from Florence, making it a great day trip that’s easily accessible with one of the 45 Regionale trains between the two cities. Between the green fields and the bright blue skies, Pisa lies peacefully amongst the undulating country lanes. Before heading to the main square, we decided to stop at a little shop to grab some bread for lunch. This turned out to be a great idea, as many people were seen laying around the lawn by the Leaning Tower to enjoy a snack of their own. Do indulge in the beautiful views of Pisa, wander along the small streets, and catch a bite at one of the many cafes that have a view of the Piazza. It really doesn’t get more beautiful than that! If you’re visiting Rome in the summertime and you’d like a break from the city heat, hilltop Frascati is a quick and easy day or evening trip by train from Italy’s capital. In Frascati, once the sun sets (which it does in quite magnificent fashion), unassuming street corners are transformed into eateries and diners flock in. Some places serve just food while others, the cantine (wine cellars), serve just wine so you’re welcome to bring your own drinks or your own dinner. People buy food from one of the many porchetta stalls where all manner of pork products, a regional speciality, are on sale. Take away pizza is also popular and it’s all washed down with litres of the local Frascati white wine. 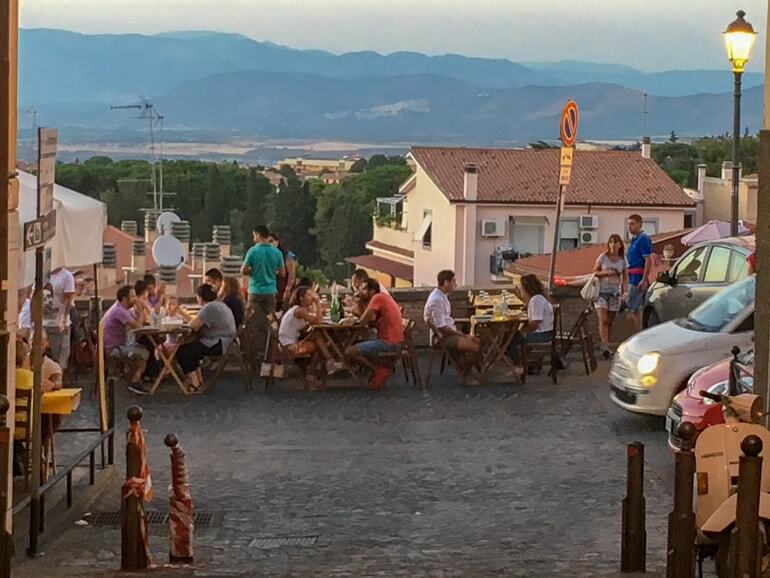 Hilltop Frascati is buzzing during summer weekends: families and friends come together for an evening passeggiata through the elegant streets: it is the perfect antidote to Italy’s hot and busy capital. We enjoyed staying in Frascati during the summer and visiting Rome for the day, but plenty of people do the opposite and visit Frascati for dinner before heading back to the city (30 minutes by train). If you’re visiting Rome in the summer with children, nearby volcanic Lake Albano is the perfect place for a refreshing swim. The Italian city of Palermo is the capital of the state of Sicily. It’s also one of the most popular destinations in Italy. With a rich history, beautiful architecture, and delicious food, Palermo makes one of the best cities to visit. Palermo is most known for the historic Arab-Norman Cathedrals – gorgeous houses of worship that blend Catholic, Islamic, Jewish and Byzantine elements. However, between the cathedrals and tucked in the narrow lanes of the old town is Palermo’s real highlight: the markets. Being closer to Africa than most of Europe, Palermo’s markets feel more like bazaars and souks than the food markets of Europe. 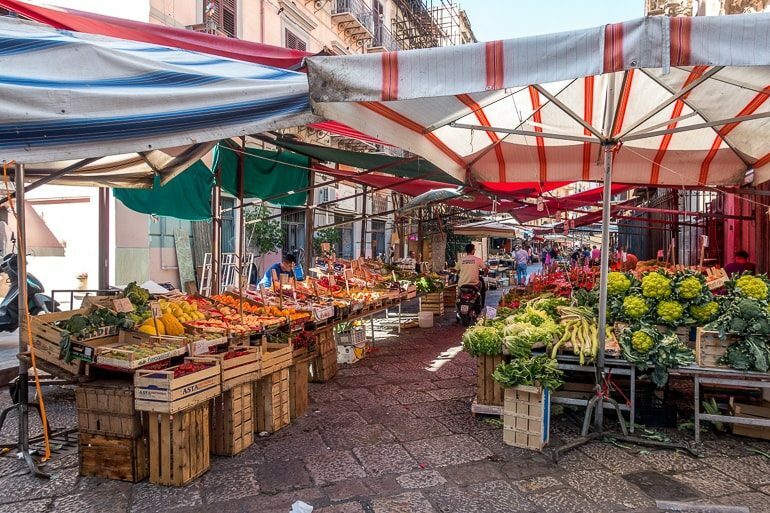 Many European markets feel like made-for-tourist experiences, but in the Ballaro, Vucciria, and Capo markets of Palermo, you’ll rub shoulders with locals. No visit would be complete without experiencing the city’s local cuisine in the markets. There’s sfincione, a half-loaf of focaccia bread with olive oil, crushed tomatoes, and onions. This is the dish that inspired Sicilian pizza. There’s pane e panelle – deep-fried chickpea fritters. And there’s crocche – fried potato croquettes. 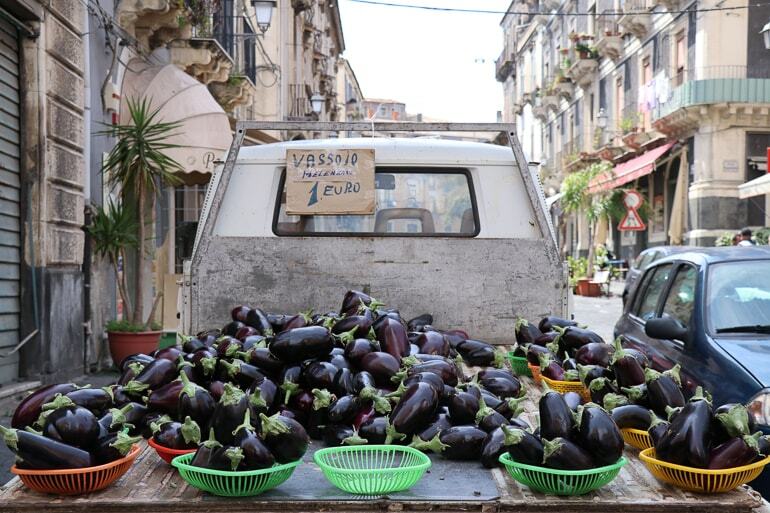 Eating your way through Palermo’s markets is one of the best places to visit in Italy. Palazzo Colonna stands out from almost every other historic Roman church, museum, or palace, because it is still a private residence. It’s open with limited visiting hours, but four Colonna brothers and their families still live in the palace. In the 13th Century, a Count from outside of Rome settled on this property which then encompassed all the Quirinal Hill, ruins of the giant Serapis Temple, and Trajan’s Column. In the ensuing years, the family’s land and importance increased through marriage, acquisition, ties with the church, and political and military successes. While following the Colonna family history through the centuries, visitors can admire the important art collection and architectural developments of the Colonna Palace. The collection’s prize pieces include Bruegels (younger and elder) in a roomful of Dutch paintings, and a wealth of 15th through 18th Century depictions of Italy. The art collection is enhanced by magnificent marble floors and impressive Baroque furnishings. The Pavilion Room showcases intriguing grotesque-style paintings hearkening back to ancient times. The private chapel reveals the personal religious practices of the family, and the throne room is arranged not for princely audiences, but for papal visits. The statue-lined Great Gallery Hall features an exception trompe l’oeil ceiling. Recommended by Laura from What’s Hot? Ravello a lesser known Italian town that you need to add to your itinerary if you’re visiting the Amalfi Coast. It sits high above the coastline and its extraordinary beauty has earned it UNESCO World Heritage status. Think small cobbled streets, authentic local Italian cafes, plazas with small churches, and the sea right at your feet. It’s a small town so it’s very doable in as a day trip or even just an afternoon. There are a couple of beautiful churches and sanctuaries worth checking out but the crown jewel is Villa Cimbrone. This stunning villa dates back over a thousand years and you’ll feel like you’ve gone back in time. 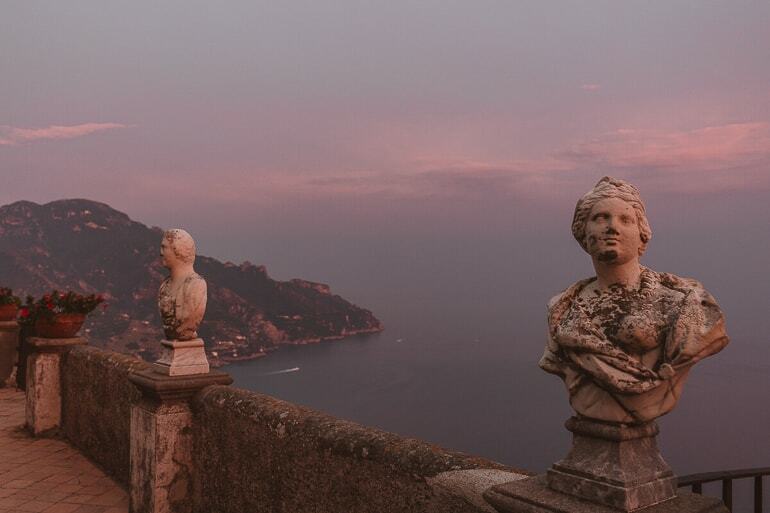 The Villa’s terrace, Terrazzo dell’Infinito (Terrace of Infinity) looks over the sea and is bordered by ancient statues. If you can visit at sunset, you’ll be in for a romantic treat as the pink sunset from here is one of the most beautiful I’ve ever seen. If you’re staying down by the sea on the Amalfi Coast then you’ll want to get the bus up here. It is possible to walk from one of the towns below, such as Minori, but whilst the path is not long in terms of distance, it is very, very steep. I would recommend walking your way down though as the views are stunning! The Italian lakes are known throughout the world; however, many are only familiar with Lake Garda, Lake Como, and Lake Maggiore. Lago d’Iseo is the 4th largest lake in Italy and is located close to Lake Garda, only one and a half hours from Milan, two and a half hours from Venice. Cool, beautiful water with mountain views makes this lake in Italy a perfect place to visit or live. Our experience of seeing Lago d’Iseo for the first time was love at first sight. Lago d’Iseo is not as touristy as the other lakes. It is surrounded by the Franciacorta wine region and with views that are spectacular! In the middle of the lake sits an island called Mont Isola, Europe’s largest lake island. Voted the 3trd best European destination for 2019, this island is only accessible by boat but filled with fun villages to explore. Lago d’Iseo has relaxing restaurants and shopping that surround the island in several different villages. The drive around the entire lake is fun with winding roads and tunnels through mountains. Hikers will love the challenge of hiking by using the old Roman pathway and seeing the magnificent views. 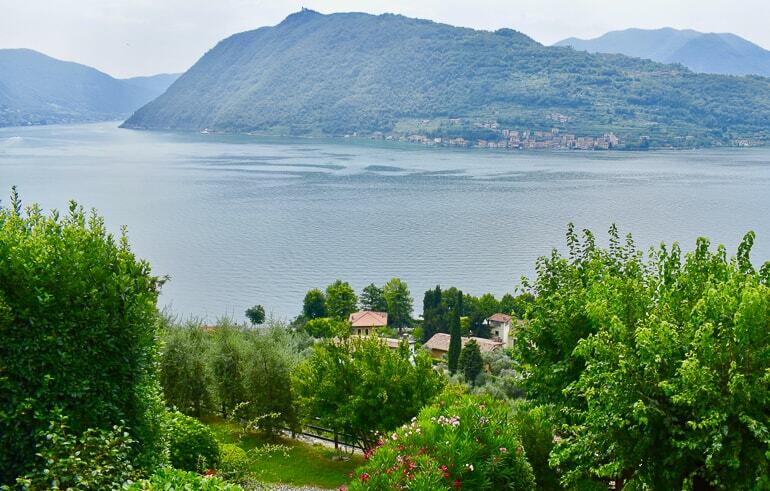 Lago d’ Iseo is often referred to as the pearl of Italy and we discovered and love its beauty, so much we decided to purchase a villa ourselves! Civita di Bagnoregio is a tiny town in Central Italy in between the regions Toscana and Umbria. The city has about 2500 years of history, but today counts only ten dwellers. Geological studies are controlling the slow and continuous hollow of the ground which gained the town the name “the fading city”. 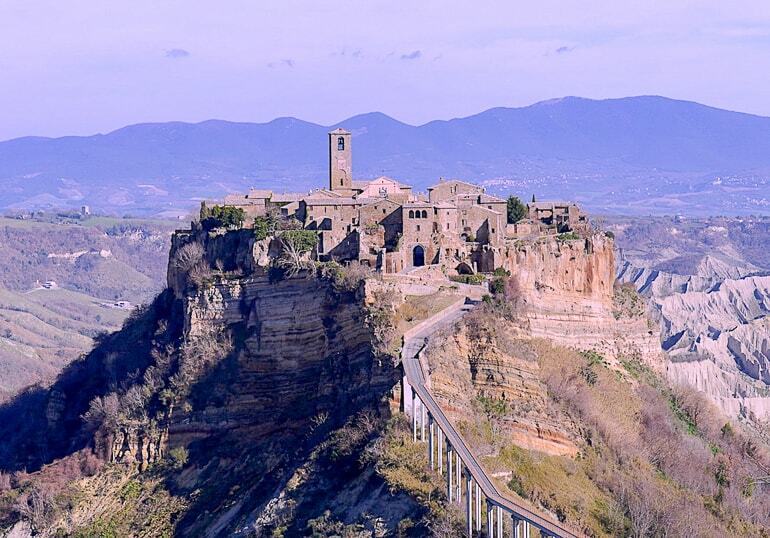 Civita rises dramatically on a tuff spur in the middle of a valley of typical clay rocks called “calanchi”, and it’s said to have inspired Japanese illustrator Miyazaki’s hanging city “Laputa”. To reach the city walls, you’ll have to walk on 300 mt long bridge which builds anticipation for what you will see inside the only gate. The medieval town is perfectly preserved and offers breathtaking views on the surrounding valleys. You’ll have the feeling you are strolling around an abandoned city, even if there are a few restaurants and shops, a church, and two museums. You can get there taking a train to Viterbo or Orvieto and the public bus “Cotral” to Civita di Bagnoregio. Entrance fee is €5. This destination can be a day-trip from Rome. Do you want to visit one of the most awesome places in Italy – Lake Garda. This stunning lake in Italy is one of the most stunning locations I ever saw. It is probably one of the most popular places to see in Italy and it’s no wonder with its picturesque setting. I spent 4 nights in Lake Garda attending a wedding in what was a surreal setting. Also, I can say I got to see some of the best things of what Lake Garda offers. If you’re visiting Lake Garda, my recommendation is to stay on one of the Euro camps. It’s the cheapest and most fun. It’s also perfect for those of you on a family holiday. Whilst staying on this epic lake in Italy, you have to drive around the amazing roads and discover some of the history this region offers. All around the lake you can find little villages that have unique settings and places to visit. 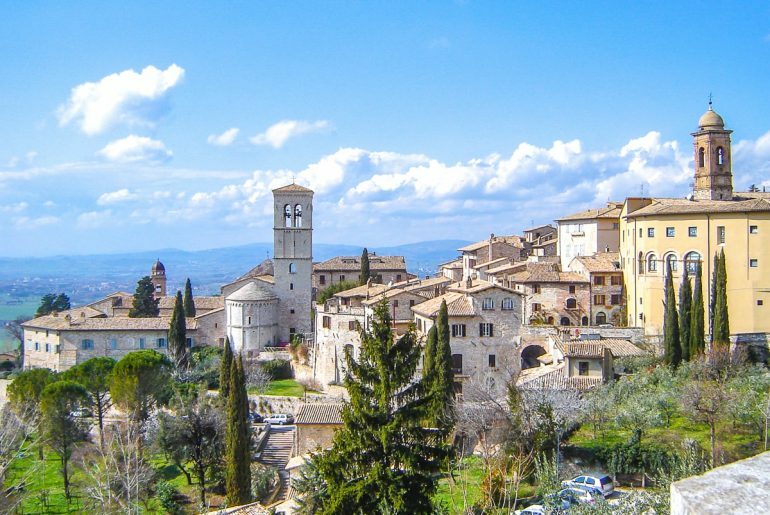 For example, you could find yourself visiting an ancient church or one of the amazing restaurants dotted around Lake Garda. And there you have it – a rundown of some of the top attractions in Italy! In the end, the country is loaded with amazing sights, attractions, towns, and vibrant cities. 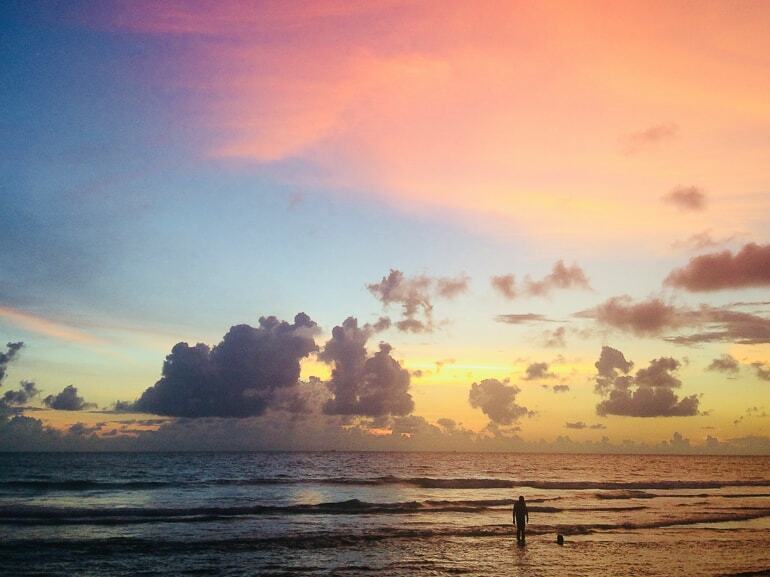 It can be overwhelming to plan a trip! Just keep in mind your interests and your timelines and we have no doubt that you will put together an Italian trip that works perfectly for you!